Christian Dior was a highly superstitious man who believed in fate and in 1946 while he was walking up rue du Faubourg Saint-Honoré, he hit his foot on an brass star that was believed to have fallen off a horse drawn carriage, and that star become one his lucky charms. 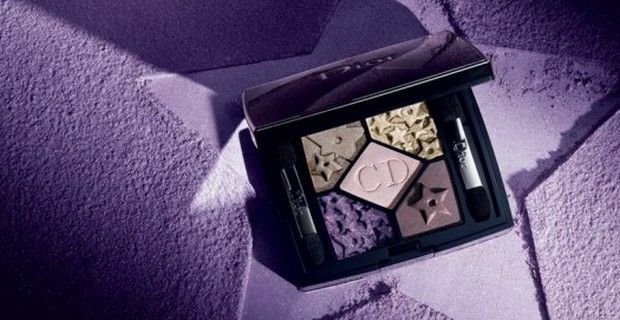 The star symbol has Always been an important part of the French fashion label and it still appears today in the House of Dior, like in the jewellery range from the Autumn-Winter 2013 ready-to-wear fashion show and also in the Fall 2013 make-up collection, "Mystic Metallics." So Dior has done away with matt finishes for this new Fall makeup collection that is fronted by Russian top model Daria Strokous and concentrates on metallics and magnetic shades, since metallics are popping up everywhere in fashion trends. The collection that was officially launched in August, mainly concentrates on the eyes and nails and features two limited edition 5- color eyeshade palettes: Bonne Etoile that contains hues of blue, green, khaki, bronze, taupe, and the other palette is called Constellation and contains purple, plum, taupe, gold and pink shades. There’s also a two 3-color palette: Silver Glow and Smoky Blue which is perfect for creating your own personal version of mysterious and magnetic smokey eyes. Eight fusion mono shades also compose the collection: Lune, Etoile, Aventure, Cosmos, Milenium, Meteore, Chimere and Hypnotique, that space from dense black to deep purple, from midnight blue to amber, unfortunately not all eight colors are available worldwide. Instead of going for the usual black eyeliner, Dior has brought to the collection just one stunning color: a rich plum shade. The magnetic and glimmering nail lacquers have names like Destin, Galaxie and Magnet, and goes from greyish pink to plum to blue. Naturally Dior didn’t leave out products to illuminate the lips, there are four lipsticks and four glosses to choose from nor did they forget about the blushes, which you can find in 13 fabulous shades.